Our team covers two cities (License numbers #EN00094 & #EN00210), five nationalities and four languages. We really love Japan, we really love our bikes and it would be our pleasure to show you around town! Cycle Osaka is our way of bringing together three of our favourite things in the world; the freedom of bike riding, the pleasure of meeting new and like-minded people, and the awesome city of Osaka. 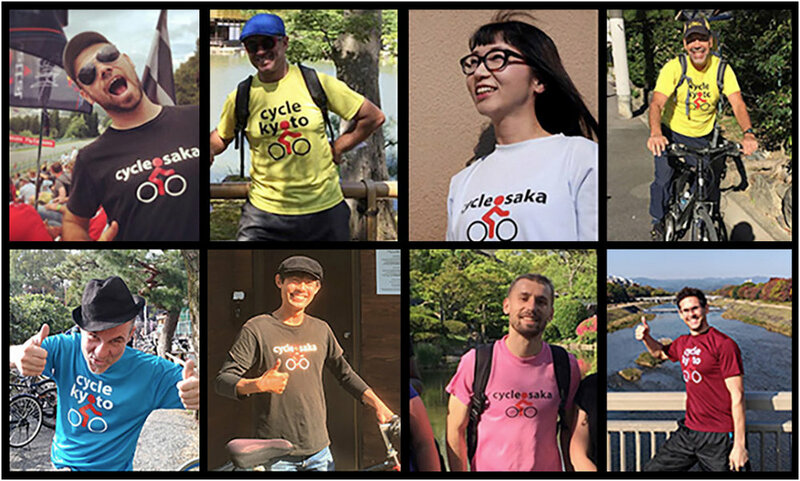 Started in early 2013, we have been running small-group bike tours of Osaka in English, Japanese, Chinese or Italian for over four years now. We think that this city is a bike city, so instead of missing out on all the fun while squished onto packed commuter trains; we make sure that you experience the beauty, energy and atmosphere of Osaka in the best possible way, on two wheels. Having crisscrossed Osaka by bike thousands times over the years, we are sure we have the insider knowledge to show you an unforgettable trip around town. The coolest cafes, the quaintest temples, the greenest parks and the best photo opportunities are waiting just beneath the surface in Japan’s coolest city. If you need any advice for après bike activities/restaurants/bars, let us show you our picks for the best sushi, the best beers and the best Takoyaki in town. Don’t know Takoyaki? You will after a day with Cycle Osaka!